I am here in Italy training with the team that I will race with at the J70 World Championship laster this month in San Francisco. It is an Italian team and this weekend were are racing the final event of their annual circuit. 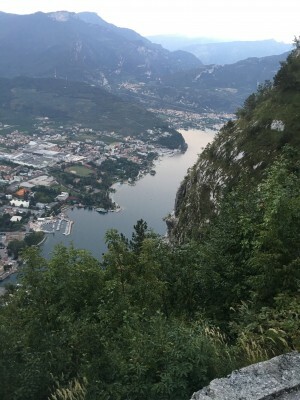 Three days and 9 races will be sailed here in Riva conducted by the Fragile della Vela-Riva. I last raced here in 1989 in my Star. At that time I gave a speech to the juniors who were all optimist sailors. Yesterday a I guy who is racing against us came and asked me to take a picture with him. He then told me he was at that speech I gave to the Opti sailors in 1989 and he was 8! Nice story but I guess that means I am getting down the road. 37 J70’s are competing here in the EuroCup. We had three races yesterday in wind from 12-7 knots. It was a non typical Garda day in that the left side paid. Usually this is a go right race track and I had that in my mind too much. A big part of our goal this weekend, as it is our first time sailing together, is to get our communications down and for me to figure out my jobs in the maneuvers. The rest of the crew is very proficient at what they do as they have been racing in the class for three years and have been second in last years World Championship. 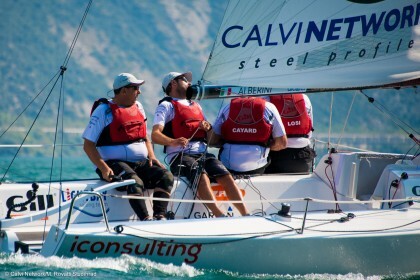 The team is called LightBay Sailing Team and sponsored by Calvi Network. Carlo Alberini is the skipper and owner of the boat. We have two-time Slovenian Olympic 470 sailor Karlo Hmeljak trimming the mainsail and Sergio Blosi trimming the kite and cleaning up after my messes with the jib sheets. I am tactician and responsible to tack the jib an hoist and drop the kite. Upwind, Sergio and I sit with our legs over the side to windward and only two crew members are allowed to “hike”. We have two great coaches: Irene Bezzi and Branko Brcin. Branko is the usual tactician for the team but has a conflict for the Worlds in SF so I am taking his place. Irene is a great sailor and super athlete. We had a decent day with scores of 4, 6, 8 on Friday to put us in second place over all. 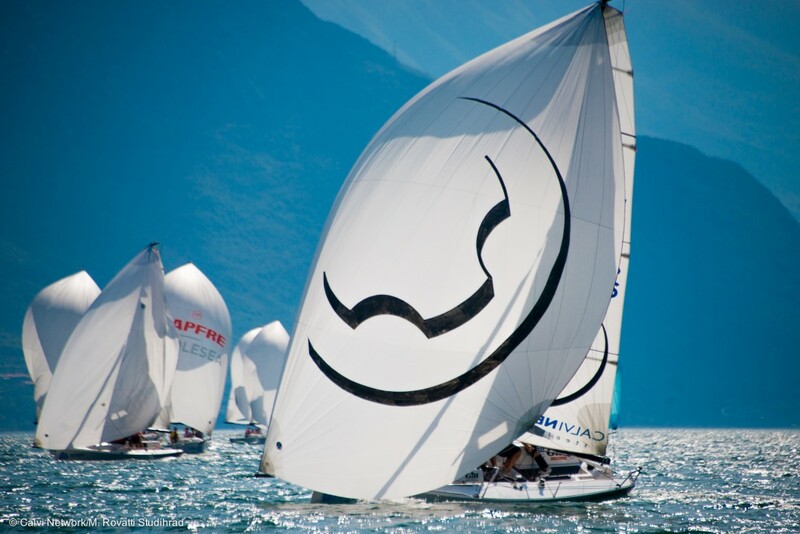 The team leading the Italian Circuit, L’elagain ,skippered by Franco Solario, had scores of 1, 5, 1. I made quite a few mistakes yesterday tactically, believing too much in the “typical” winds here which favor the right side. We had three excellent starts which is important in the foundation we are building for the worlds. Yesterday after sailing, she and I hiked-ran up the side of a cliff, 2000′ vertical, to a little church called Santa Barbara. Irene took it easy on me and waited for me. Hear best time is 35:40. I made the climb in 39:30 which was 3 minutes faster than I did it on Wednesday evening. Always good to be chasing someone! Riva and Lake Garda are beautiful places. Usually Tuscany, Rome, florence get all the ink followed by Capri Venezia, etc. But these lakes in northern Italy, surrounded by very tall and steep mountains are spectacular! 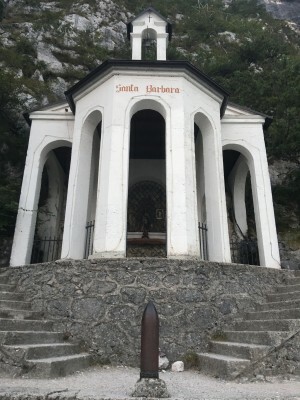 The town of Riva is very charming. And of course, the food is excellent.